Swelling of the soft tissues of the face is often associated with an infected tooth. Once decay has entered into the soft center of the tooth, known as the pulp, bacteria can make there way into the bone. 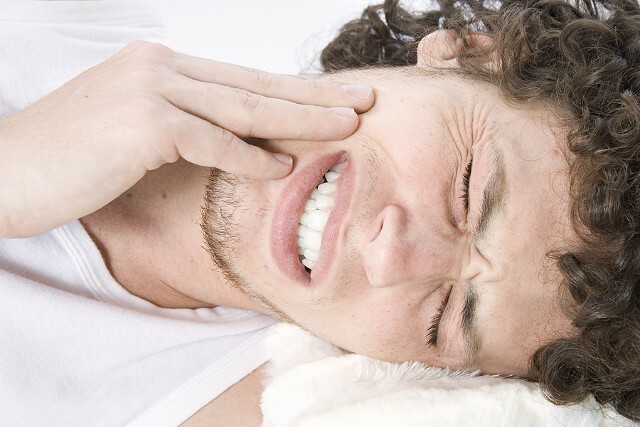 This can be a painful experience as pressure within the bone exerts pressure on the nerves which surround the teeth. Left untreated, the infection can "eat" its way out of the bone and begin to swell soft tissues. Dental infections come in two varieties, a localized abscess that forms a pus epulis or a cellulitis, which is a more diffuse type of swelling. Epulis formation often produces swelling that is soft, warm, red and localized to a smaller area. In such cases, the pus from the infection can be drained and the patient is placed on antibiotics until the offending tooth is either extracted or treated endodontically. In cases of cellulitis, where the infection is much more firm, diffuse and no focal point for pus formation is noted, the swelling cannot be drained. This type of infection--typically more severe--must be treated with antibiotic and a rapid treatment of the infection source. Swelling in certain areas is more dangerous than others. Swelling in the area of the upper eye teeth--called a canine space infection--can travel up about the nose. Concerns about cranial, secondary infections are warranted with this location and prompt care is even more of a concern. Swelling with infected wisdom teeth can sometimes cause impairment of the airway because of swelling of the tongue or pharynx. This type of swelling can be life threatening and must be treated aggressively and promptly. When you are first seen by a dentist, they may or may not recommend that the infection be drained. Drainage can be accomplished by opening the tooth and allowing exudate to flow out the root canal, or it may be achieved by incision. The treatment choice of either extracting the tooth or attempting to save it with root canal therapy is often the deciding factor. If the tooth can be removed at that first visit, drainage may not be necessary in all cases. Any patient presenting with a dental infection will be placed on antibiotics and often pain medication as well. It is imperative that the patient be compliant in taking all of the antibiotic and to take it as prescribed. Even if the tooth is extracted or a root canal is completed, the antibiotic prescription should be finished. In recent years, the advent of antibiotic resistant bacteria has made the importance of doing complete rounds of antibiotic therapy all the more important. If you stop your antibiotic after only a couple of days of therapy, the strong bacteria may still be alive and viable. Such bacteria can reproduce and cause another infection that is more resistant to antibiotic than the first one. If you are on antibiotic therapy for several days and see the infection worsening, you must contact the doctor who prescribed your antibiotic. Some bacteria are resistant to certain types of antibiotics and not changing the antibiotic in a timely fashion can lead to significant problems. As a rule of thumb, if after 48 hours of dosing on a particular antibiotic, the swelling does not begin to get better, you need to seek further help. In addition, patients can develop drug allergies to certain types of antibiotics that they have on multiple occasions before. If severe itching, sudden reddening of the skin--with or without hives development, difficulty breathing because of chest constriction or a flushed feeling occurs soon after taking a dose of antibiotics occurs, you could be suffering from a severe allergic reaction. Go immediately to the hospital emergecy room with the aid of a family member or call 911. Slight itching, stomach upset or mild hives can indicate an early allergic reaction and the antibiotic should not be continued. You should contact your dentist for further instructions and a different antibiotic. While saving an infected tooth is usually the best course of action, heavily damaged teeth that are not restorable or financial constraints often dictate a tooth must be extracted. Should the tooth appear to be a surgical extraction, you will most likely be referred to an oral surgeon. Infected teeth can be difficult to anesthetize and significant bone removal can make the procedure difficult. An oral surgeon who can do general anesthesia, concious sedation and who has many specialized instruments can make a difficult extraction much more pleasant for the patient. Whatever course of action you chose--to either remove a tooth or to save it with root canal therapy, it is important that the treatment be done promptly. Leaving infected teeth in the mouth will result in subsequent infections which can grow more severe with each onset. Repeatedly "hitting" an infection with antibiotics is not a good practice and is the primary cause for drug resistance in bacteria. As such, our office will only provide two rounds of antibiotics for any given dental problem. It is imperative that the patient work quickly to have the treatment planned procedure completed. 1. Do not put a heating pad on the swollen area because if eases the pain. Such can draw the infection to the heat source and a fistula can develop on the outside of the cheek, causing scaring. 2. Do not put aspirin on the swollen gum tissue and hold it there. This will cause an acid burn on the tissue, creating even more pain because of the traumatic ulcer. 3. Do not push on the swelling to get it to drain. This can spread the infection. 4. Do not take another person's antibiotics or just a few left over from before. The antibiotic may not be appropriate for a dental infection or you may contribute to a drug resistance in the bacteria. In addition, it is a felony and a federal offense to take a prescription not prescribed to you. 5. Do not hesitate in seeking prompt medical attention. Infections can destroy bone, cause nerve damage, create distant abscesses in the body, cause bacteremias (blood infections) and weaken the immune systems. Bacteria invasion of the body is a serious issue and while our immune system is actively fighting these invaders, there is a point where our body cannot keep up to the challenge. Any infection is a serious matter and it must be treated promptly.